Mr. S. Sivakumar, publication relation officer of the Trust gave welcoming speech and the Trust honorary president, Prof. S. Periyandi delivered the leading speech. Dr. Saravanane Poobalane, founder of the Trust gave an inspirational talk. Honourable Mr. M.O.H.F. 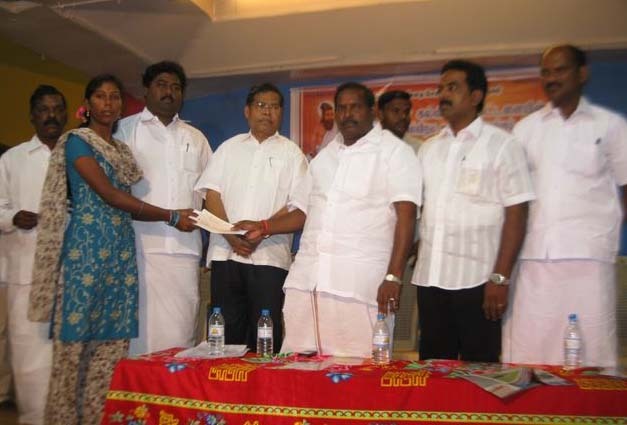 Shajahan (education minister, Puducherry State) presided over the event. Honourable Mr. M. Kandasamy (minister for Welfare, Puducherry State), Mr. R.K.R. Anandaraman (Member of the Legislative Assembly, Puducherry) and Ex-Member of Paraliament Prof. M. Ramadoss were guest honours. Mr. P. Sakthivel (Veerampattinam Councillor) and Mr. Kangeyan, president of Veerampattinam Panchayat were special speakers. The Managing Trustee Mr. Sethupathi gave vote of thanks. Scholarships ranging from Rs. 3,000 to 10,000 were given to 55 students belonging from various villages of Puducherry state studying Diploma and degrees (arts, science and engineering). Selected 31 students from different coastal villages in Puducherry were supported with cash awards and educational materials. The fourth annual Thiruvalluvar day sports was held at Government Girls Higher Secondary School, Kalapet. The Managing Trustee Mr. Sethupathi gave welcoming speech. The leading speech was given by the Trust honorary president, Prof. S. Periyandi. Head teachers, Mrs. Gomathy and Vasuthevan presided over the event. An inspirational talk was given by the founder of the Trust, Dr. Saravanane Poobalane. The members of the Kalapet council, Mr. Poongavanam and Mrs. Saroja, parents association chairmen, Mr. Aadiyaptham and Mr. Mathiyazhagan gave special speech before distributing the prizes. Mr. Sivakumar Sarangabani, the public relation officer of the Trust gave vote of thanks. The event was greatly felicitated by school teachers, students, parents of students, Trust members and friends. About 313 winners and runners-up students selected from various sports were appreciated with a number of prizes. A range of sports materials was also presented to the school. Educational development club secretary, Mr. Velmurugan gave welcoming speech. The head master of the school, Mr. Kamalakannan and delivered greeting speeches. Member of the Legislative Assembly of Ariyankuppam constiuency, Mr. R.K.R. Anandaraman, was the guest of honour. The advisor to the school, Mr. Muthaiyan gave vote of thanks. The event was greatly felicitated by school teachers, students, parents of students, Trust members and friends. The welcoming speech was given by Dr. Souyasarada Saravanane, the adviser to the Trust. The Trust honorary president, Prof. S. Periyandi and the managing Trustee Mr. K. Sethupathi delivered the leading speech. Mr. S. Sivakumar, publication relation officer of the Trust gave a note on the last 5 years activity of the Trust. Dr. Saravanane Poobalane, founder of the Trust gave an inspirational talk. Honourable Mr. M.O.H.F. Shajahan (education minister, Puducherry State), honourable Mr. M. Kandasamy (minister for Welfare, Puducherry State), honourable Mr. Maladi Krishna Rao (minister for Tourism, Puducherry State), Mr. R.K.R. Anandaraman (Member of the Legislative Assembly, Puducherry), Mr. P. Sakthivel (Veerampattinam Councillor) were special speakers. The Treasurer of the Trust, Mr. P. Radjassegarane gave vote of thanks. Scholarships ranging from Rs. 3,000 to 10,000 were given to 75 students belonging from various villages of Puducherry state studying ITI, Diploma and degrees (arts, science and engineering). 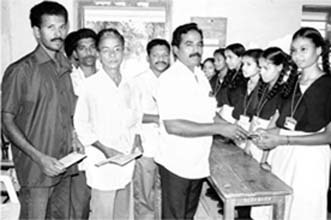 Seventy students of 10th standard were presented with a stationery package for their public exam. 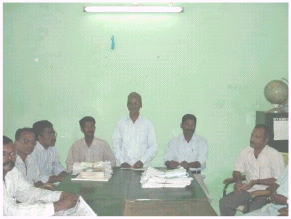 The Trustees inspired the students to perform well in the exams before distributing the package. 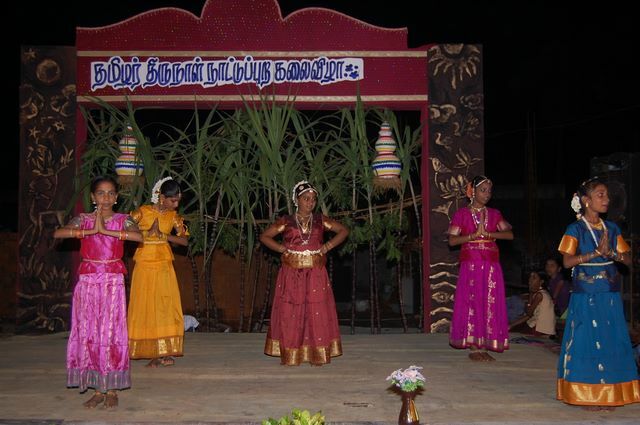 The third annual Thiruvalluvar day sports was held in the New Generation school at Kakayanthope, Ariyankuppam. Mr. Sivakumar Sarangabani, the public relation officer of the Trust gave welcoming speech and the Managing Trustee, Mr. Sethupathi presided over the event. An inspirational talk was given by the founder of the Trust, Dr. Saravanane Poobalane. The member of Ariyankuppam council, Mr. P. Sakthivel and the president of Veerampattinam Panchayat, Mr. A. Kangeyan, presided over the event. Member of the Legislative Assembly of Ariyankuppam constiuency, Mr. R.K.R. Anandaraman, was the guest of honour. The head master of the school, Mr. Kamalakannan and educational development club secretary, Mr. Velmurugan delivered greeting speeches. The advisor to the school, Mr. Muthaiyan gave vote of thanks. The event was greatly felicitated by school teachers, students, parents of students, Trust members and friends. 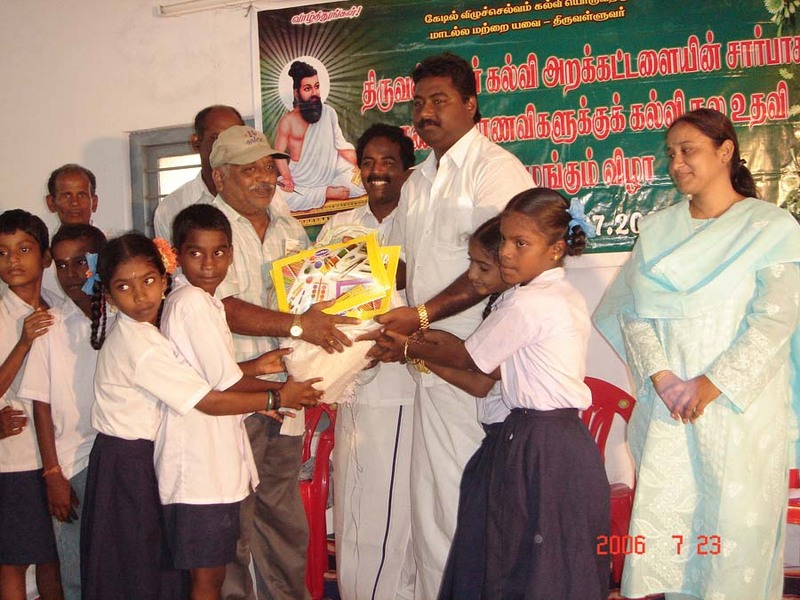 All the winners, runners and participated students in various sports conducted by the Trust were appreciated with a number of prizes including Thirukural books and stationery materials. Two racks for keeping the lunch bags of students were prenseted to the school. A scholarship was given to an engineering student to cover his annual tuition fee. The welcoming speech of the event was given by the public relation officer of the Trust, Mr. Sivakumar Sarangabani and the Managing Trustee of the Trust, Mr. Sethupathi presided over the event. Mr. P. Sakthivel, a member of Ariyankuppam Council and the head master of the school were delivered special speeches. The event was concluded with vote of thanks given by Mrs. Mageshwari Radjassegarane. Scholarship was given to a degree student. 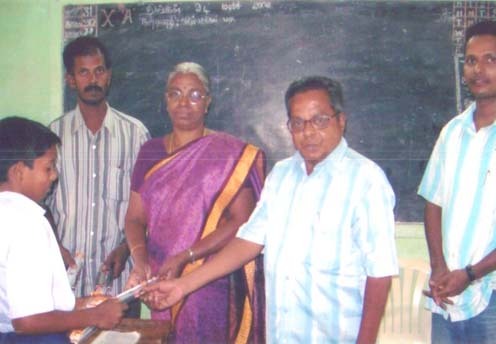 Three students who had scored 1st, 2nd and 3rd place in 10th standard final exam 2008 were supported with cash awards for their higher studies. 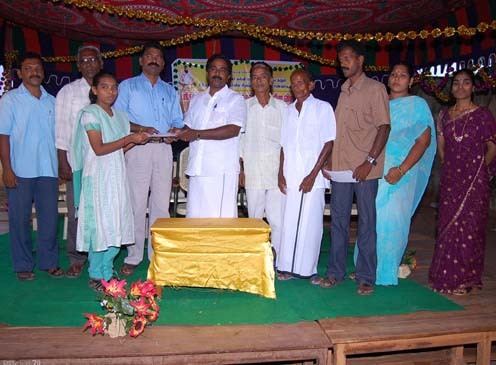 Gifts were presented to 3 students who scored 100% mark in individual subjects in 10th standard final exam 2008. A number of prizes were given to students who participated and won in various sports competition conducted on the Children's day. In the presentation event, scholarships were given to two degree students belonging to fishermen families who are facing a severe problem due to lack of income. The scholarships were given to cover annual tuition fee for doing their degree programs. Mr. Sivakumar Sarangabani, publication relation officer of the Trust gave the welcoming speech and our Trust honorary president, Prof. Periyandi delivered the leading speech. Our Trust founder Dr. Saravanane Poobalane gave an inspirational talk. Honourable education minister for Puducherry State, Mr. M.O.H.F. Shajahan presided over the event. Honourable Mr. M. Kandasamy, minister for Welfare in Puducherry State, Honourable Mr. Maladi Krishna Rao, minister for Tourism in Puducherry State and Member of Paraliament Prof. M. Ramadoss were special speakers. The function was greatly felicitated by Mr. P. Sakthivel, a member of Ariyankuppam Council, Mr. Kangeyan, president of Veerampattinam Panchayat and guests from different villages of Puducherry. Scholarships ranging from Rs. 3,000 to 10,000 were given to 85 students from various villages of Puducherry state studying ITI, Diploma and degrees (arts, science and engineering). Selected 30 students from different coastal villages in Puducherry were supported with cash awards and educational materials. The value of support given in the event was about 10% more compared to the support given in the last annual presentation event. In the event, 65 students studying in 10th standard were given with a stationery support package which contained all the necessary items useful for their following public exam. The students were strongly encouraged by the Trustees to excel in the exams. Various sports competitions including a mini marathon were conducted by our Trust for the pupils of Sindhani Sirpi Singaravelar government high school to mark Thiruvalluvar day, which falls on 16th January every year. The school head teacher Ms. Hemalatha presided over the event and the chief educational officer for Puducherry State Mr. S. Krishnaraj was guest of honour. The event was greatly felicitated by Mr. P. Sakthivel, a member of Ariyankuppam council, Mr. Kangeyan, president of Veerampattinam Panchayat, school teachers, trust members and friends. The trust is hoping to enhance the sports of young students studying at different schools in Puducherry in due course. All the participated students were encouraged with a number of prizes. A range of sports materials was also presented to the school to encourage sports among the pupils. 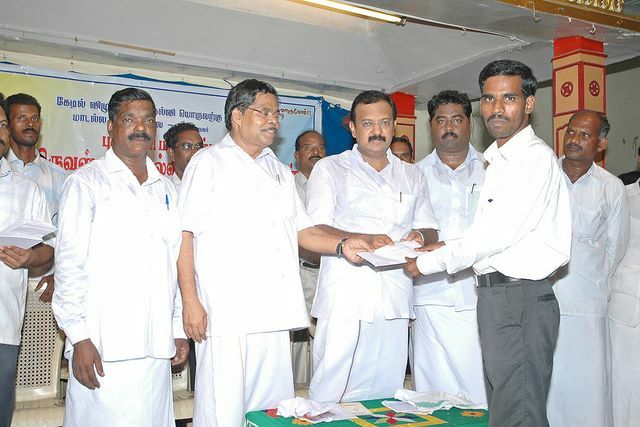 In the presentation events, scholarships were given to four degree students belonging to fishermen community whose families were affected by Tsunami in December 2004. The scholarships were given to cover annual tuition fee for doing their degree programs. The welcoming speech of the event was given by our Trust advisor Dr. Souyasarada Saravanane and our Trust Managing Trustee Mr. Sethupathi delivered the leading speech. An inspirational talk was given by our Trust founder Dr. Saravanane Poobalane. Chief educational officer for Puducherry State Mr. S. Krishnaraj presided over the event. Mrs. Meg Faulton, a teacher from Kirkcudbright academy, Scotland, UK was the special guest of honour in the event. The function was greatly felicitated by Mr. P. Sakthivel, a member of Ariyankuppam Council, Mr. Kangeyan, president of Veerampattinam Panchayat and the school head teacher Ms. Hemalatha. The event was concluded with vote of thanks given by Mr. Kangatharan. About 160 students were supported with note books, pens and other stationery materials in the event. Selected 3 out going students were supported with vouchers for buying educational materials. 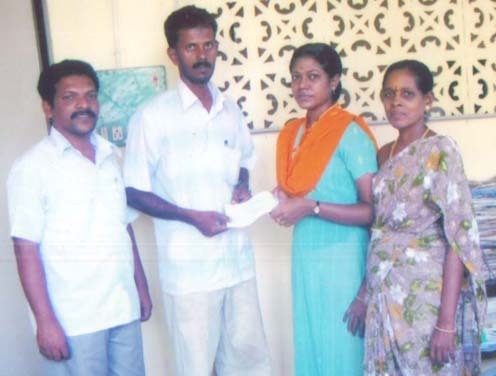 Scholarship was given for one of the out going students for higher studies. Various general knowledge books were presented to the school library. Advisor to our Trust, Dr. Souyasarada Saravanane gave the welcoming speech and our Trust honorary president, Prof. Periyandi delivered the leading speech. An inspirational talk was given by our Trust founder Dr. Saravanane Poobalane. Honourable education minister for Puducherry State, Mr. M.O.H.F. Shajahan presided over the event. 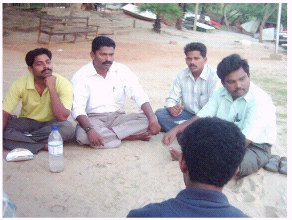 Member of Paraliament Prof. M. Ramadoss and Mr. R.K.R. Anandaraman, a Member of the Legislative Assembly, Puducherry state and Director for Puducherry fisheries department were invited speakers. The function was greatly felicitated by Mr. P. Sakthivel, a member of Ariyankuppam Council, Mr. Kangeyan, president of Veerampattinam Panchayat and Mr. Mangaiyar Selvan, General Secretary of fishermen organisation, Puducherry. Our trust members are very pleased to say that we supported about 600 students and a higher secondary school in the presentation event under the various scheme listed below. The value of support given in the event was about three fold higher compared to that of last year, 2006. 1. More than 500 selected students studying 11th, 12th (aged 16 and 17) in the academic year 2007-08 and 12th passed students (aged 18) from the academic year 2006-07 from different coastal villages in Puducherry were supported with various educational materials including English grammar books, Thirukkural books, note books, pens and other stationery materials. 2. Selected 30 students from different coastal villages in Puducherry were supported with cash awards and vouchers for buying educational materials. 3. Scholarships were given to 35 graduate students to cover their annual tuition fees and other educational expenses. 4. Water purification and cooling units were given to Kalapet higher secondary school, Puducherry for the betterment of the student’s health. 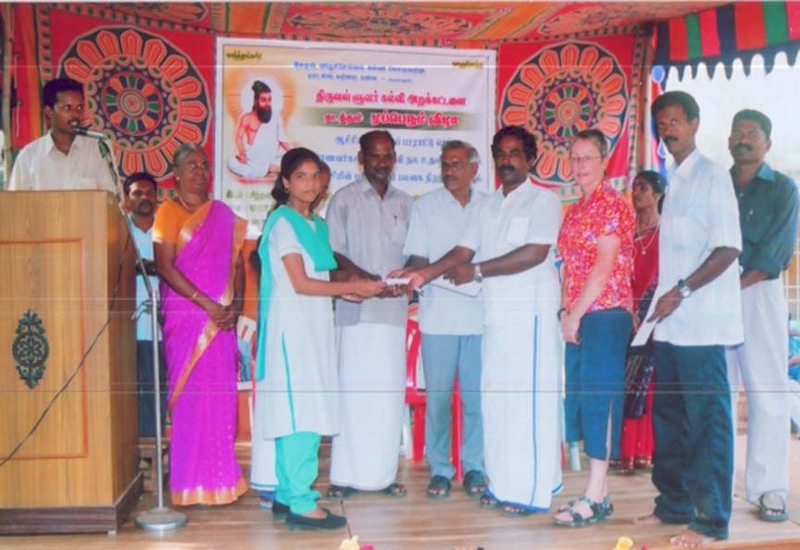 The event was jointly organised by a social service organisation (TREE India) based at Vanoor council (Villupuram district, Tamilnadu) and Thiruvalluvar Educational Trust. Mr. Kanapathy, a Member of Legislative Assembly, Tamilnadu State, was guest of honour. Village presidents and social service members from different villages in Vanoor council, members of TREE India and our Trustees greeted the students in this great occasion. This is our first trust event to support students in Tamilnadu. Our Trust is supporting to conduct evening classes for a under developed community at 3 villages in Vanoor council through three different tuition centres (one centre for each village). More than 150 students are benefiting from this project. These newly established tuition centres are promoting education among the students currently studying in schools, students that had dropped their education in the middle of their studies and children that never attended school. Blackboards and various sports materials were also distributed to each village. Our Trust has also signed an agreement with TREE India organisation to support the education of young children in all 3 villages initially for one year and hoping that this agreement will be extended further. We are also expecting to extend our support to other villages in Vannor council in the near future. Our trust conducted a variety of sports competitions among the pupils studying at Veerampattinam girls government middle school to mark Thiruvalluvar day, which falls on 16th January every year. The event was greatly felicitated by Mr. P. Sakthivel, a member of Ariyankuppam council, school teachers, trust members and friends. This is the first time for our trust to conduct a sports day event and the trust is hoping that this will continue forever to enhance the sports of young students studying at different schools in Puducherry. The winner, runner and participating students were encouraged with a number of prizes. A range of sports materials was also presented to the school to encourage sports among girl students. 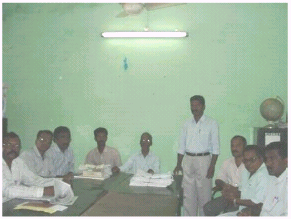 Our second annual aid presentation event to school students was held on 23rd July 2006 at the night hostel, Veerampattinam, Puducherry – 605007. The welcoming speech was given by our trust honorary president, Prof. Periyandi. The speech given by one of our trust advisors, Dr. Souyasarada Saravanane, encompassed the aims of our trust and our current and forthcoming projects. An inspirational talk was given by Dr. M. Vallathan, the president of the fisher-folk development organisation, Puducherry. Mr. R.K.R. 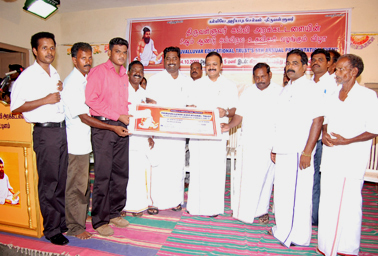 Anandaraman, a Member of the Legislative Assembly, Puducherry state, presided over the event. Mrs. Debjani Dutta, a correspondent of The New Indian Express, Puducherry was an invited speaker. The function was greatly felicitated by Mr. P. Sakthivel, a member of Ariyankuppam Council, Mr. Kangeyan, president of Veerampattinam Panchayat and Mr. R. Kumaran, General secretary of Sindhani Sirpi Singaravelar social service organisation, Puducherry. 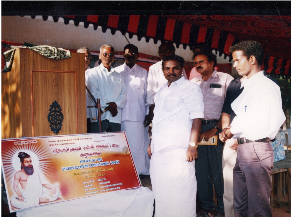 Our trust inauguration and distribution of aid to the school students function was held on 29.08.2005 in the premises of Sindhani Sirpi Singaravelar government high school, Veerampattinam, Puducherry – 605007. The trust was inaugurated by Mr. D. Jayamoorthy. Member of Legislative Assembly, Puducherry state. The function was greatly felicitated by Mr. Rajmohan, M.S.Swaminathan research foundation, Puducherry and Mr. Jayantha Ganguly, Auroville foundation, Auroville. Mr. Alexander Moffatt was the guest of honour from Wenden, Essex, England.In the presentation event, supports were extended to 900 students including 30 students from 15 neighbouring coastal villages in Puducherry. Students were encouraged by providing them cash awards, books, notebooks, school bags, stationery items and other educational needs.